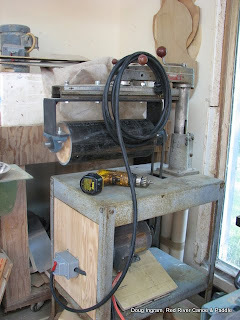 The motor is installed and the wiring complete on the thickness sander that I am building. It works! It didn't explode or anything nasty like that. The drum turns smoothly, I am happy that my efforts to install it well centered were successful. I think that I need to put a larger belt pulley on the shaft to slow it down some. I still need to make a dust shield, true the drum, attach abrasive paper, and make a table. I haven't decided whether I will make a power feed table or simply hand feed on a sliding platform. As this will only be used for my guitar making materials, all shorter than 24", I am thinking that I will just make a hand feed table. I can always make a power feed later. Yeah, right! Posted by Doug Ingram at 9:27 a.m.